If you have read my recent review of the VISATON NoBox kit (Tip 55), then you already know about my passion for open baffle designs. One key point is baffle size. It's easy to get the impression that bigger is better, but that is not necessarily so. An extreme baffle introduces a significant reflecting surface into the listening environment. It can interfere with the distribution of reflected energy (especially rear-wall reflections) in the room and may adversely impact the soundfield at the listening seat. A large baffle is also more likely to flex and resonate due to the action of the woofer. And there is always the domestic spouse acceptance factor. The largest baffle size one could imagine is an infinite open baffle, which can be approximated by mounting a woofer into a listening room wall so that it vents into another room or the great outdoors. The downside, of course, is that the backwave is totally lost from the listening room. Much of a dipole's rich ambiance in fact comes from rear-wall reflections, which means that an infinite baffle's in-room behavior would resemble that of a large closed box. Clearly, too small a baffle is counter productive, unnecessarily giving up bass extension due to front-back cancellation. In my view, the VISATON NoBox baffle meets the Goldilocks criterion: its' not too large nor too small. Approximating in extent the critical 100Hz half-wavelength, it's just right! Since it makes for an ideal OB launching pad, the decision was made to embrace it as a platform for evaluating various woofers and wide/full range drivers for OB applications. There is more to Kentucky worth writing home about than merely Bourbon and horse racing. I am thinking specifically of Eminence loudspeakers, headquartered in Eminence Kentucky. And that is where Darrel Hawthorne, the progenitor of Hawthorne Audio, turned to for the design and manufacturing of his driver line. The Silver Iris line consists of a 15-inch coaxial and the Augie - a 15-inch woofer intended for OB applications. The Coaxial driver came first. Darrel tells me that following on its success, he wanted to offer a bass augmentation driver that could extend frequency response low enough in an open baffle context to fully enjoy almost any genre of music with minimal compromise. And so he went back to the engineers at Eminence with a wish list in hand to develop the Augie. The Augie is a well-built woofer incorporating Pro features such as a cast basket, a Kevlar reinforced paper cone, a long-excursion poly/cotton cloth surround, a vented 2.5-inch voice coil, and a copper shorting ring. Power handling is said to be 225 watts RMS. Three parameters are essential for ideal performance in an open baffle: a high driver total Q (Qt), a low free-air resonance frequency, and a generous excursion capability. The Augie delivers on all three counts. Maximum cone excursion is a very decent 7 mm. Free-air resonance is 27Hz, and the Qt is 0.92. The latter parameter gives the dipole woofer "wiggle room" to compensate for the baffle step decrease of 6 dB per octave down to its resonance frequency. The ideal Qt for OB applications is somewhat debatable, with some designers favoring a value around 1.0. Bob Carver's 'Amazing' loudspeaker comes to mind as an extreme example. The speaker, when it was under review in Stereophile's listening room, featured a line array of inexpensive dipole woofers whose chief claim to infamy was a Qt of about 1.2. While bass extension was commendable, the quality of the bass was less desirable. Carver himself characterized the bass quality as "rolling" and claimed that he preferred it that way. To my ears, the bass was simply ill-defined, the opposite of tight; the wrong compromise in my book: quantity over quality. Dipole bass confers certain advantages such as freedom from boxy resonances, but attention to proper damping is still an issue as it is with conventional box woofers. There is, unfortunately, no free lunch. Increasing a woofer's Qt is accomplished by scaling back the size of the magnet, which reduces sensitivity. The only way to maintain both a high sensitivity and a high Qt is to increase the woofer's resonance frequency. Thus, a woofer with a high Qt and a low resonance frequency offers at best only medium sensitivity. It is not surprising therefore that the Augie's sensitivity is only about 89dB. Measured in the VISATON baffle, the Augie produced impressive low-frequency extension. 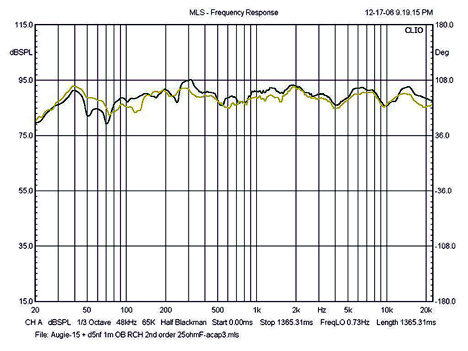 The following Figure shows its near-field response which is extended clear down to the resonance frequency of 27Hz. Very impressive extension indeed! 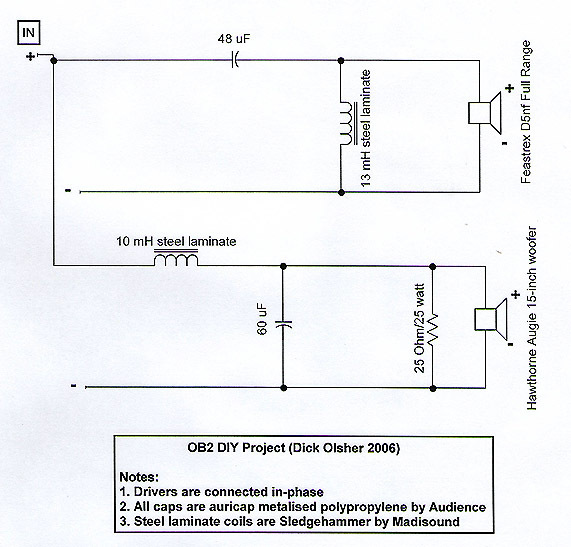 I suspect that the ideal open baffle Qt may well be in the range of 0.6 to 0.7, as I found it necessary to slightly damp the bass range by shunting the woofer with a 25 Ohm resistor. Tuning the bass damping may well be a function of the room and personal preference, but I can report that when tweaked as described above and driven with the EAR 834T integrated amplifier, both bass impact and pitch definition were superb. It seems to me that many listeners confuse bass weight with bass extension and opt for a subwoofer when bass weight is lacking. The problem typically lies in the upper bass, the octave from 120Hz to 240Hz where much of an orchestra's foundation and acoustic power resides. This is the octave that box woofers have a hard time coping with, basically managing to sound boxy through this range. In contrast, the Augie managed to shine here, elucidating instrumental fundamentals with consummate clarity and 3D realism. The Augie's performance was so open-baffle friendly that I decided to use it as a foundation for several full range drivers. The OB2 finds the Augie mated with the fantastic Feastrex D5nf. Future projects will feature the Lowther DX55 and C55, as well as the new Jordan JXr 6HD module. This innovative Japanese full range represents a collaborative design effort between Mr. Akiyama, the president, and Mr. Teramoto, the builder. While several other models are under development, including field coil versions, the D5nf (permanent AlNiCo magnet) is said to be their most perfect transducer and core product for some time to come. I had seen a version of this driver at the 2006 CES, and it has, in the interim, undergone a slow maturation process. The design was finalized during the summer of 2006; the most notable production change being the addition of a phase plug ala the Lowther full range. While from the front this driver may look like an ordinary variation on the twin-cone full range, the view is radically different from the backside. The large domed iron yoke is the crux of the Naturflux magnetic circuit. Conventional speaker yoke designs produce sharp bends in the flux distribution and fail to optimize the flux in the voice coil gap. Whereas the Naturflux circuit is said to focus magnetic flux more efficiently within the pole piece and voice coil gap, reaching a gap flux density of 16,000 Gauss in the case of the D5nf. Sensitivity is specified as 95dB to 97dB. The cone material is custom paper from one of Japan's premier paper makers, manufactured to exact specifications under controlled conditions. Total mass of the moving assembly is an astonishingly low 2.5 gram per unit, and drivers are assembled in pairs with precisely matched cone assembly masses. The low moving mass and large gap flux density results in an explosive acceleration factor. Transient speed is superb and the overall presentation is both dynamic and detailed. The D5nf can unravel complex musical passages with crystalline clarity, which is no doubt a function of its controlled transient decay. It is capable of erecting a titanic soundstage with palpably focused image outlines, at least when mounted on the VISATON open baffle. And to top it all of, this is the smoothest sounding twin-cone I have heard to date. No EQ networks needed here. Cone break up resonances are well controlled. There is no fly in the ointment in the form of a prominent presence region shout or harsh lower treble. The phase plug definitely does its job - the upper treble being extended to 20kHz, at least on axis. Of course, the extreme treble beams, so be prepared to toe in this driver toward the listening seat. Though, at the other frequency extreme, I would not want to push it below 100Hz, at least on an open baffle. And, as many of you know, I am not a fan of rear-loaded horns. It would be a crime in my book to imprison a driver with the musical integrity of the D5nf in a box! Unlike some of the Fostex twin cones I have worked with in the past, which fuzz over detail, the Feastrex delights in revealing detail. Though you had better be prepared to drive the D5nf with a high-quality matching amplifier and front end. And, for the record, I am still living happily ever after with the Altmann Micro Machines Attraction DAC. The OB2 was quite magical when driven with the EAR 834T integrated amplifier, as microdynamic nuances were given full scope of expression. If you have a weak heart, I suggest you bypass the OB2 in favor of a lower resolution device. In summary, I am inclined to agree with Feastrex' claim of supremacy to the extent that the D5nf is presently the best sounding 5-inch fixed magnet full range money can buy. The task of blending these two fine drivers was guided by the KISS principle “Keep It Simple, Stupid“ at least as simple as was possible taking the drivers' needs into account. My goal was to maintain a full-bodied balance through the upper bass transition region without impacting bass or midrange resolution, and as it turned out, that necessitated the use of second order crossover networks. That may disappoint some purists, but I did try the first order approach and was not satisfied with the results. The final network (shown below) makes me very happy and I believe coaxes the best sound possible out of the driver complement in the context of the VISATON OB. Parts quality is a major factor in a speaker of this caliber. The caps selected for this project were the auricap metalised polypropylene type by Audience. For starters, this cap is extremely well built, and most importantly, my listening tests showed a clear preference for the auricap over the Solen Fastcap. In general, the auricap appears to introduce less fuzz into the signal chain relative to the average metalised poly cap. Its sound could be best characterized as smooth, yet detailed, with excellent transient clarity. The critical 48 uF cap in series with the D5nf was built up from three lower value caps: 30 + 15 +3. For the last measure of high-frequency purity, I bypassed these caps with a 0.01 uF Teflon film cap by Relcap. Some of you may have noticed by now the discrepancy in sensitivity between the Augie woofer and the D5nf (89dB versus about 97dB) and must be wondering how is it possible to match these drivers without padding down the Feastrex full range? The answer lies partly in the subtlety inherent in the definition of sensitivity, which is not referenced to an actual watt at 1 meter, but rather to 2.83 V across the terminals of the loudspeaker. For an 8-Ohm load, that translates into 1 watt of power sunk into the load. However, in the OB2's driver transition region, the Augie's impedance is about 6 Ohms while that of the D5nf is 16 Ohms. For 2.83 V across the OB2's input terminals, the Augie is dissipating 1.33 watts to the D5nf's 0.5 watts. The power ratio amounts to about 8.5dB and means that the Augie is working that much harder to keep up with the D5nf. Add 8.5dB to the Augie's nominal sensitivity and you end up with 97.5dB. 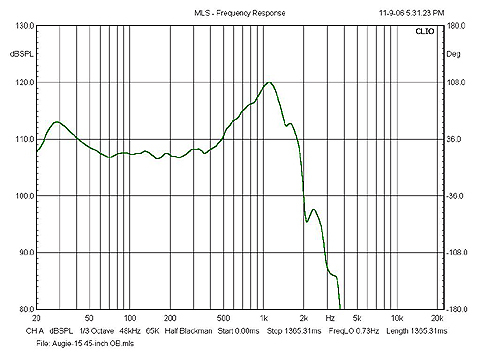 The proof is in the measured frequency response, which is shown below. These are in-room measurements (with the EAR 834T amplifier) at 1 meter for both the right and left channels. 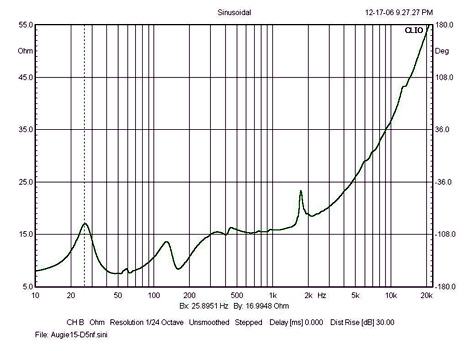 The impedance curve for the complete OB2 speaker is shown below. In view of the need to provide end user support, Feastrex conducts international business solely through established dealers. Feastrex has informed me that they have not established a fixed MSRP for various international markets and interested parties should inquire regarding local dealerships. Feastrex has recently appointed the Lotus Group as its US distributor. Please contact them regarding US retail pricing.